Written and directed by Nora Ephron, based on books by Julie Powell, Julia Child and Alex Prud'homme this movie is based on a real-life blog (web log). A young woman sets herself the task of preparing all the food in Julia Child's cookbook within a single year, and writes a blog on her progress. Julie is a public servant in a thankless job -- she processes calls from the survivors and families of the 911 attacks. By night she and her husband live above a pizza parlour and she overcomes her frustrations at not having a writing career by setting herself a target, cooking the French way for friends and her husband, and by writing about the experience. 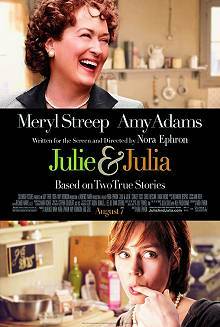 Narrated by the lead actress, Julie & Julia is a slice of life, a biographical tale of a person finding a challenge and a writer finding a voice. Intercut with Julie's story is that of the famous cook Julia Child. Child too, was a government servant who married a 'nice guy' in the same profession and decided to fill her childless free time with learning to cook, and then with teaching, and with co-writing a cookbook. Child's story is one of hard work, wonderful life in France, and the frustrations of finding a publisher for real French cooking in a age of Instant Food cookbooks. The two stories mesh nicely, and as Julie says, cooking Julia's food gives her the sense that she is sharing Julia's life. We join with Julie in her hope that one day she might meet her idol. Ms Ephron is a master storyteller, and this script is well-paced, well-balanced between the two story lines, and very enjoyable. Well-served.